I haven’t posted anything in recent weeks. 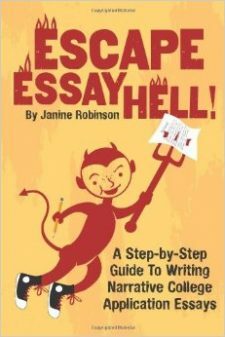 My role as a college essay tutor wraps up in January and February. But if you are still working on an essay or personal statement, I would read through this blog for ideas and inspiration! This spring, I have also been in the thick of the college admissions craze because my son is a high school senior. And boy what a ride it has been. One of the hardest parts is the waiting–and I know some of you are STILL waiting to hear from prospective colleges and universities. Hang in there!! And then there are the rejections. My son certainly had his share, and it didn’t help that they were the first schools to report. And one was his top pick. But he cast a wide net, and now has three great options to pick from, which is the next challenge. So, it all works out! And it will work out for you, too! Try as hard as you can to tune out others students and parents who talk up certain schools, especially the “prestigious” ones, and focus on what will be the best fit for you. Remember, you are the one who will go there, not them! Don’t let yourself get overwhelmed with all you have to do. Just keep up with the various steps, and it all works out. None of it is really that difficult. Stay open to learning about the different schools, and when you are in the area of a college or university (even if you don’t necessarily want to go there) your sophomore or junior year, drop by and check it out! Your opinions about colleges will change a lot in just a year or so. College counselors always talk about aiming high but having back-up schools. We learned the hard way that you should have at least one or two schools you KNOW you will get into. If nothing else, it makes any early rejections a lot easier to endure. Well, enough preaching. I most likely won’t be posting very often until the next college admissions “season” kicks off this summer. But I promise to be here to help you through it–and like my own kids’ I’m confident you will land in a good place!! Good luck! As a fellow essay tutor, I can understand what you are bringing to the forefront. Since your son is in the thick of it, as a high school senior, I can only imagine what it’s like at your house these days. Thanks for the great entry, and please keep us up to date on his essay-ings. I think its pretty cool you are willing to help out others with their college essay. This can be a sticky point for many bright students. Keep up the good work!